You are here: Home / Ethnic Groups / The People of Sulawesi / Who are the Muna? The Muna people (also called Wuna) live in the province of Southeast Sulawesi on the larger islands of Muna and the west coast of Buton, and the smaller islands of Kadatua, Siompu, Bangkomalape, Tiworo, and Telaga. According to tradition, the word muna was taken from the name of a hill with a “flowering rock.” Today this place, Bahutara, has become a tourist attraction. The word wuna means “flower” in the Muna language. The Muna people are grouped into several sub-groups, but the largest division occurs in the middle of the islands of Muna and Buton. The Muna people on the northern halves of these islands speak the more prestigious variety of the language, while those on the southern part of Muna island speak the GuLaMas dialect. 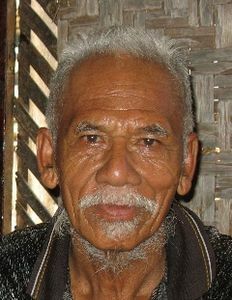 The people of the islands of Kadatua, Siompu, Telaga and on the west coast of Buton also speak varieties of this dialect. The northern variety of Muna has markers that register different social levels depending on the person being addressed. Muna is similar to the language of Buton, and the history of the Muna is closely tied with that of Buton. The Muna make their living as farmers, with their primary crops being cashews, corn, rice, and seaweed. Other crops include sweet potatoes, sugar cane and various kinds of spices. A large portion of their commerce has come from marketing the products of the jungle such as teak wood and rattan. The custom of pokadulu (mutual assistance) influences various activities in the Muna community, as groups of people will gather to do large projects such as clearing, planting and harvesting fields. Those who live by the sea have been successful in pearl farming and cultivation of seaweed. The Muna usually live in the interior of the island, though there are a good number of coastal communities. They live together in kinship groups, called Tombu. In general, these communities are well connected by roads. The island of Muna is not as mountainous as the island of Buton to the east, but it has many caves that are often used as fresh water sources. Lineage is patrilineal (father’s side). In marriage, the groom pays for the bride. The price is determined by the groom‘s social status. The higher the status of the groom, the more he must pay for his bride. Before the marriage, the prospective groom is in a trial period by the prospective bride’s family. Due to these traditions, many young people choose to elope. The majority of the Muna people follow Sunni Islam. There is a Christian minority, with two villages being historically Catholic. Followers of Islam believe they will be judged on their knowledge of the Qur’an (Islamic holy book) as well as their deeds done during this lifetime. However, traditional animistic beliefs still influence many aspects of Muna life. The mobility of the Muna people is high and they have spread into other areas. They need training and assistance to better manage their natural resources. They need formal education as well as practical training in order to take advantage of employment opportunities. The Muna also need better access to reliable and affordable health care.